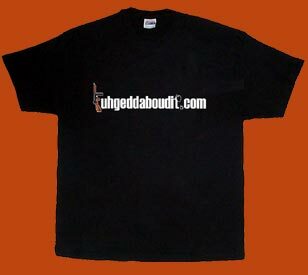 Fuhgeddaboudit.com is the original and only site on the net where you can finally, after months of preparation and due diligence, not to mention getting the OK from the heads of the 5 families to put this fiasco together, get the best quality hats and tee shirts with the most famous quote of all time..... FUHGEDDABOUDIT!!!!!! Now how many times have you heard that today? And to answer your question before you even ask it, NO, they didn't fall off a truck....... so don't ask! Let's just say we have friends that owe us favors. Capisce??? We kept the prices low so everyone can afford them ... even you. We call it friend of a friend pricing. 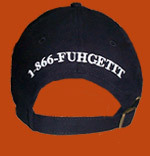 You aint gonna find quality stuff like ours with printing and embroidery work like this anywhere for less. Ya hear me??? And don't be fooled by Fugazy's. This is the real deal. The Godfather of cool. Go ahead, you don't need Uncle Franks' permission. Order some for yourself, and make sure you pick up a few XXL's for da boyz in the neighborhood. They're gonna love ya for it!!!! Remember .... Buy it, Wear it and Fuhgeddaboudit! If you would like to order direct you can send us a check (only if it's good), with your order clearly written so even we can read it. But remember, checks may take up to 10 days to clear. Hey, we gotta watch you guys!! We also accept US Postal money orders. And of course ... cash!!. Now with cash we can ship same day. But we don't suggest sending cash through the mail ... just in case someone gets sticky fingers along the way. Hey, ya never know. To order by phone, you can call our Consigliere toll free Monday - Friday 9:00am to 5:00pm EST. Now go, enjoy yourself. 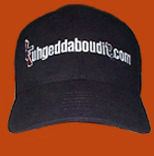 And in of couple of days, the goodfellas at Fuhgeddaboudit.com are gonna give you what you want.